I was at a party, and one of my favorite local fiddlers, Devon Leger, was about to play a tune. I just happened to have two video cameras in my pocket: a Flip Mino HD, and my iPhone. I leaned both cameras against the door frame, one in each hand. The one with finger in the frame is the iPhone, which I held steady for one long take. With the Flip I got fancy―I got multiple angles, I zoomed, and I panned. In Compressor, I cropped the iPhone footage to match the 16:9 format of the Flip when I converted both to ProRes. In the first two cuts I alternated the sound―the clips with the captions have sound from just that camera. After that, I ran both audio tracks together. The sound is better than I thought it would be, particularly from the Flip. The video quality is about what I expected―the iPhone is a toy, not a camera. The Flip looks a lot better. I'm keeping the 5D's though. 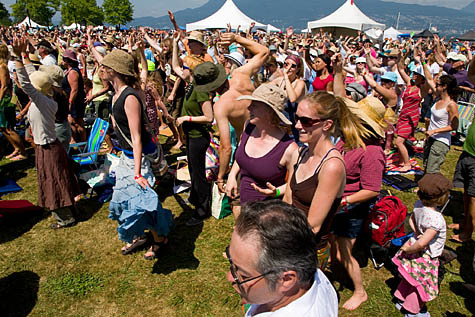 I just got back, well sunburned, from three days of music at the Vancouver Folk Music Festival. I've been going for 16 years, Robin for 28. Forgot to take a card reader and had to wait until I got home to see the photos, just like the old days. They wouldn't let me bring a video camera (I asked), so just stills. Set's on Flickr. I'm staying away from the fray today, mostly because the grounds of Seattle Center will look like it does in this photo for most of the day. 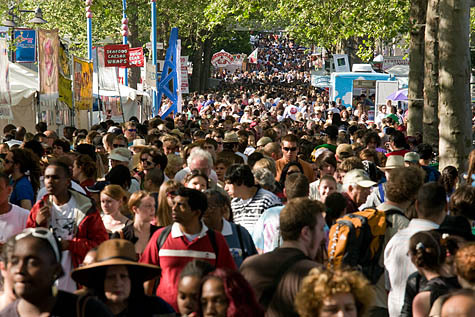 Without my refuge of the dance hall (which may be as crowded, but it's a crowd in motion in an organized fashion), Folklife swamps the defenses against my latent agoraphobia. Photos from the past two days in this Flickr set. A towering figure in the folk music scene, Utah Phillips died peacefully in his sleep last night. On the schedule at Folklife this afternoon was a tribute to Utah Phillips. He was scheduled to appear, but was too sick to travel. “This is how he figured out a way to show up,” a friend said to me.